Published: Sep 15, 2018 to ? David is your typical Japanese high school student, except for one little thing... He looks exactly like Michelangelo's famous statue! As a part of the JUMP START initiative, the first three chapters of Shishunki Renaissance! 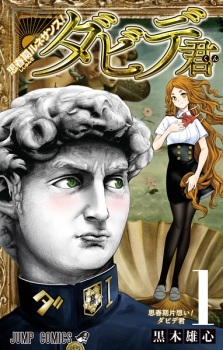 David-kun were published in English as Teenage Renaissance! David in VIZ Media's digital Weekly Shonen Jump on the same day as the Japanese release. This is the stupidest and funniest thing I've read from weekly jump. I haven't laughed so hard since reading DMC. You might think at first glance that a statue high school manga couldn't really be that funny, and after each chapter you might think it cant get any more stupid than it already has, but it does. I'm not over exaggerating when I say this manga is the most stupid thing to come out of weekly jump so far, I read pretty much everything on weekly jump for a while now, which is how I found this amazing series. To me there's no comedy manga out there yet that rivals the stupidity of this manga without falling behind in comedy and/or art aspects. Which brings out my other point on why you should read this; the art in this manga is beautiful. The statues and actual art made by the characters in this manga is allot higher detail then would would ever expect from a series like this. You would think that they are traced in some way, but allot of it is original pieces from the author himself with allot of references to and slightly changed art pieces from the renaissance art period. I specifically created a MAL account just to post a review about this godly manga and I just hope it gets animated soon so that others can enjoy this masterpiece.